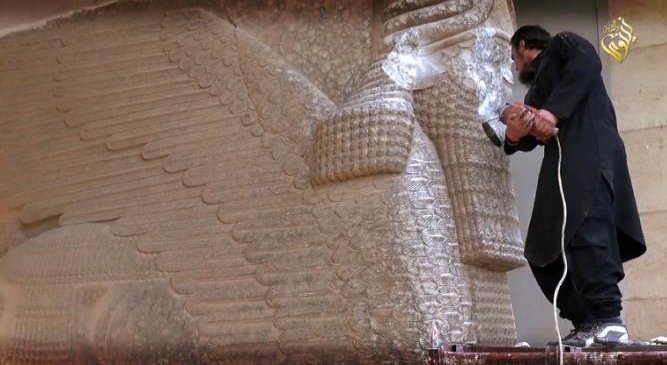 The destruction by ISIS (Islamic State) of the ancient Assyrian city of Nimrud in Iraq and potential destruction of Palmyra in Syria has shocked the world—almost as much as the organisation’s previous beheadings of its captives. Unfortunately, an article in this week’s New Scientist on sea level rise titled “Five Metres and Counting” (apologies print or paywall access only) suggests that climate change has already committed the world to the destruction of human heritage many orders of magnitude greater than anything ISIS is capable of doing. You may be familiar with the Intergovernmental Panel on Climate Change (IPCC)‘s end of century sea level rise forecast (here, page 11 in the report). 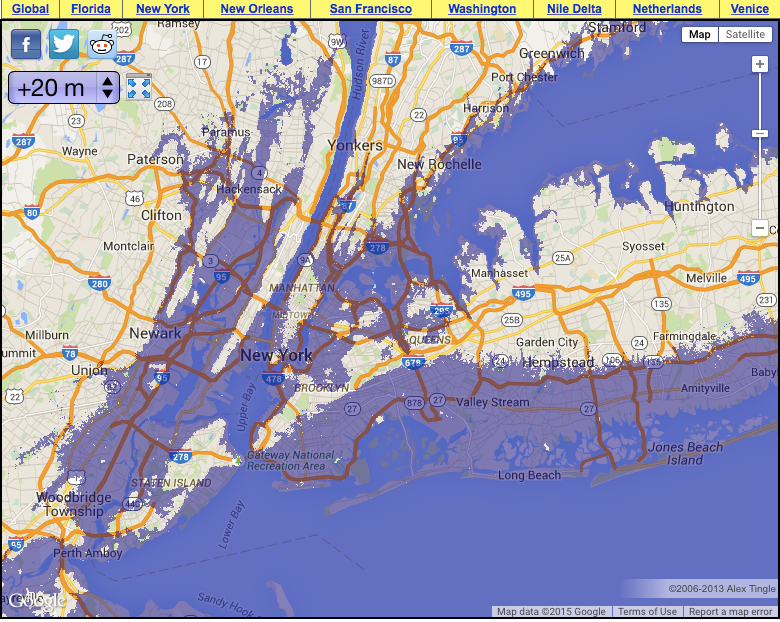 This pegs the upper sea level rise outcome at just below one metre (click for larger image). Whatever we do now, the seas will rise by at least 5 metres. Most of Florida and many other low-lying areas and cities around the world are doomed to go under. If that weren’t bad enough, without drastic cuts in global greenhouse gas emissions–more drastic than any being discussed ahead of the critical climate meeting in Paris later this year—a rise of 20 metres will soon be unavoidable. 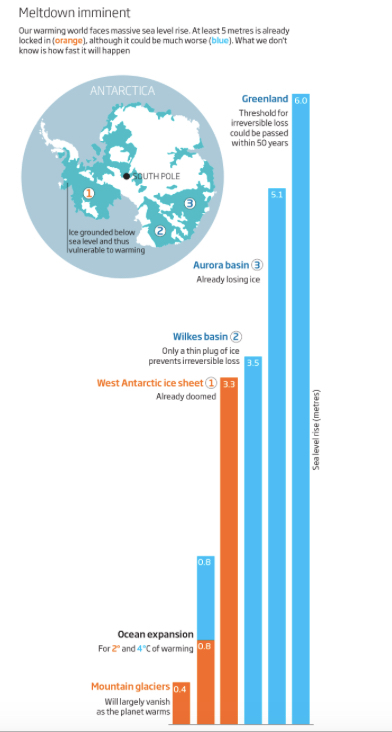 The arithmetic is pretty depressing (chart from New Scientist article): 0.4 metres for mountain glaciers, plus 0.8 metres for ocean thermal expansion, plus 3.5 metres for the West Antarctic ice sheet (the areas in orange in the chart below, click for larger image). If we go past 2 degrees Celsius of warming and get to 4 degrees, then we add all the blue bars as well. Since the IPCC’s Fifth Assessment Report (AR5) was published, fresh evidence has emerged relating to West Antarctic ice sheet instability. Moreover, two large basins, the Aurora and the Wilkes, that form part of the East Antarctic ice sheet also appear vulnerable. In short, if we push up to 4 degrees Celsius of warming, then we are likely committing ourselves to 20 metre sea level rise. These projections are Old Testament in terms of the scale of the catastrophes they portend; indeed, ISIS could only dream of unleashing such wanton destruction. Yet, in our failure to tackle climate change, such wanton destruction appears to have been accepted by the G20 elites and, frankly, ourselves. This entry was posted in Climate Change and tagged AR5, Aurora basin, IPCC, sea level rise, The New Scientist, Wilkes basin. Bookmark the permalink. 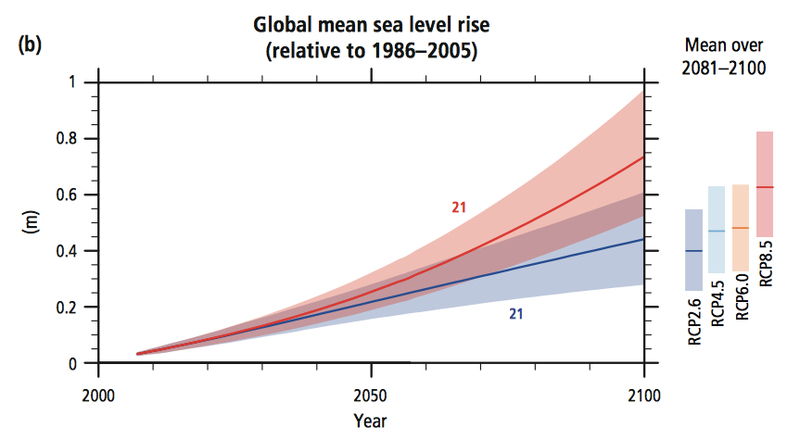 I always find it deeply frustrating that all these projections seem to assume that the future just ends at 2100, and you get blanket statements like “5 meters of sea level rise” or “2C of warming”, when the long term reality will likely be much, much worse than either of these, because half of the graphs haven’t even hit a kneepoint by the end of the century. Sam: Exactly. Post 2100 is treated as another world. Yet it is only 85 years into the future. Yet here we are marking various anniversaries related to WW1 one hundred years ago and talking of how the carnage of WW1 shaped our world. We lament the senseless destruction of 20th century wars but appear indifferent to any destruction inflicted on future generations — destruction we at least have the power to moderate even if we can’t stop it entirely. Is the bar chart from the New Scientist article? Does the article give a source for the numbers, please? Thanks. RP: Chart is from New Scientist article. Full reference: Le Page, Michael. 2015. “Five Metres and Counting”, New Scientist, June 13, pp. 8-10. The article references two Nature articles for the West and East Antarctic numbers. I will add links. IPCC AR5 has the thermal expansion and mountain glacier numbers. NB: these are slow processes, so to get to 20 metres we are going out hundred of years. But due to the scale of the processes, once these glaciers tip no technology will save them. So we are locking in unprecedented destruction of our coastal heritage going forward. Very depressing. Thanks for the links. The numbers broadly match the graph although there is some variation in estimates. It is a sad situation. I can only hope that the melting will indeed be slow, giving people enough time to relocate without too much pain. Perhaps future cities will be beautiful floating islands!